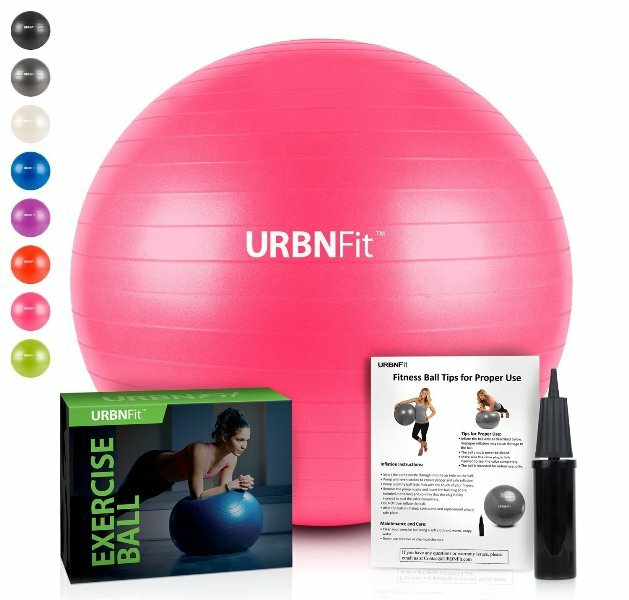 The URBNFit is a Gym Grade Fitness Ball made out of Professional quality PVC material with Anti-Burst properties and capable of holding up to 2000lbs in-order to withstand the most rigorous workouts. On the other hand, this exercise-ball comes with a quick dual-action inflation pump that fills up your ball with minimum effort while the included Workout Guide provides you with various exercises. All in all, this exercise-ball makes working-out more effective whether you’re at home or office. Made of ultra tough, burst resistant PVC rubber. Ideal choice for beginner and advanced use. Perfect for tough or weighted exercises. A non-slip surface for safe everyday use. Perfect for both men & women. Available in 45cm, 55cm, 65cm, 75cm & 85cm diameters. Available in blue, black, Pink, Red, Silver, Purple & Green. Allows you to perform a range of balance & stability exercises. Perfect for use with yoga, Pilates or general strength and balance training. Perfect for strengthening the abdominal, core and lower back muscles. Includes a dual action inflation pump & 2 air stoppers. It includes a workout guide that provides you with different exercise-samples. 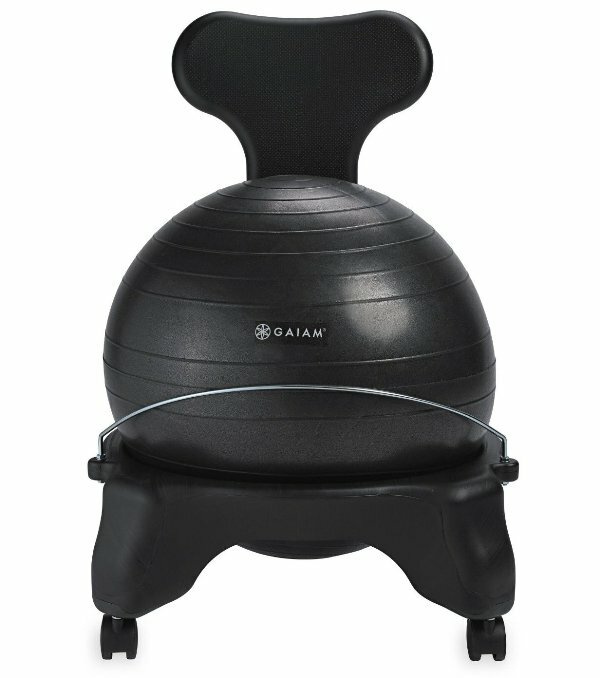 The Gaiam Balance Ball Chair is an alternative desk chair created by leading health & fitness experts’ in-order to help improve on back health and core strength. 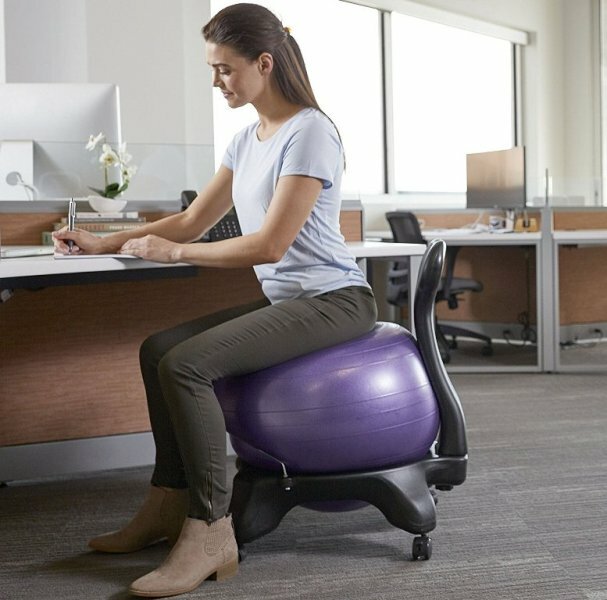 In fact, this Ball Chair features the same yoga ball used in the exercise guide coupled with rolling, lockable caster wheels and it’s even designed for users of about 5′ to 5’11” tall and fits on most standard-height desks. Additionally, this Ball-chair supports a weight-capacity of 300-pounds, includes an adjustable metal-support bar, an air-pump, 4 easy-glide casters and a desktop exercise guide. All in all, this Ball-chair will help you build a healthier core, align the spine, relieve back pain and stiffness, boost energy levels and even increase productivity within an active body and mind. Developed under the consultation of chiropractic pioneer. Designed for users of 5-feet to 5-feet, 11-inches tall. Includes removable 52-centimeter Balance Ball. Includes an adjustable back support bar. 4 easy-glide caster wheels (2-locking back & 2-regular front). A secure metal ball holder. It includes an air pump and stoppers. Includes a desktop exercise guide. Helps build a healthier back, align the spine & relieve pain. It’s an effective tool for strengthening core muscles and improving spinal alignment. The height of the back of the chair is 2.5 feet tall. The base measures 20 inches wide from one side of the wheels to the other. It requires some basic assembly. 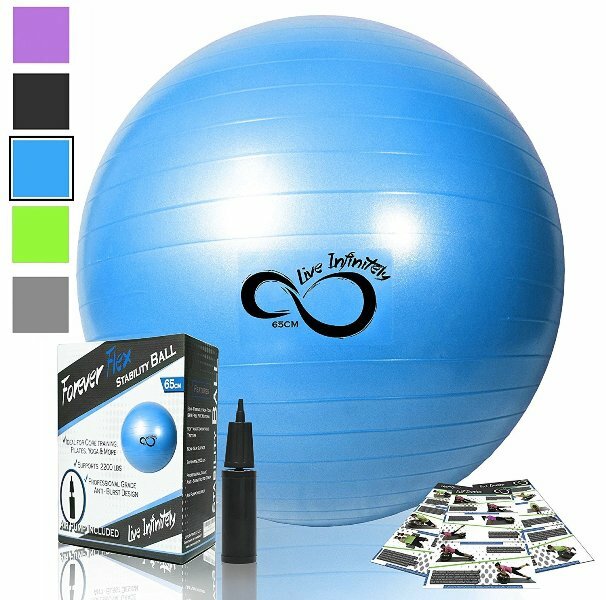 The Live Infinitely is a Professional Grade Exercise-Ball made of Professional grade PVC material that is Anti-Burst Tested and 100% BPA & Latex Free. In fact, this exercise-ball can withstand up to a 2cm cut without explosively deflating and it can support over 2200-lbs of weight so that you always enjoy your Pilates, yoga or other exercises without worrying about your weight and it can also be used as exercise ball-chair at the office to improve on your sitting posture. Additionally, this exercise comes with a hand pump, extra air plug, valve-remover tool and access to digital exercise guides and online training workouts to help you reach your goal of a healthier life. All in all, this exercise-ball will make a perfect addition to your home exercise tools in-order to improve on your core and overall strength and its even perfect for Pilates, yoga, Crossfit and other low impact exercises. 2200 pound static weight limit with a 600-pound Anti Burst Testing. Raised & Reinforced anti-slip ridges for advanced level yoga moves. A BPA, Latex & Heavy Metal Free 2mm PVC construction. It can withstand up to a 2cm cut without explosively deflating. 4 Attractive color options to fit your decor. 5 Different sizes ranging from 45cm – 85cm. Includes an easy-to-use hand pump and air plug remover tool. Includes an online workout guide and how to video access. It will help improve on your core and overall strength. Perfect for Pilates, yoga, Crossfit & other low impact exercises. It can be used as an exercise ball chair at the office to improve your posture. UR Superior Fitness is a 600-lb Exercise, Yoga and Stability Ball with Heavy Duty Gym Quality Resistance Bands in-order to help you improve on balance, Core Strength, Back-Pain and Posture. In fact, the included resistance bands come with cushioned handles so you can exercise in comfort while the included exercise poster provides with over 100 isolation exercises and the pump makes inflating the exercise-ball very simple and easy. 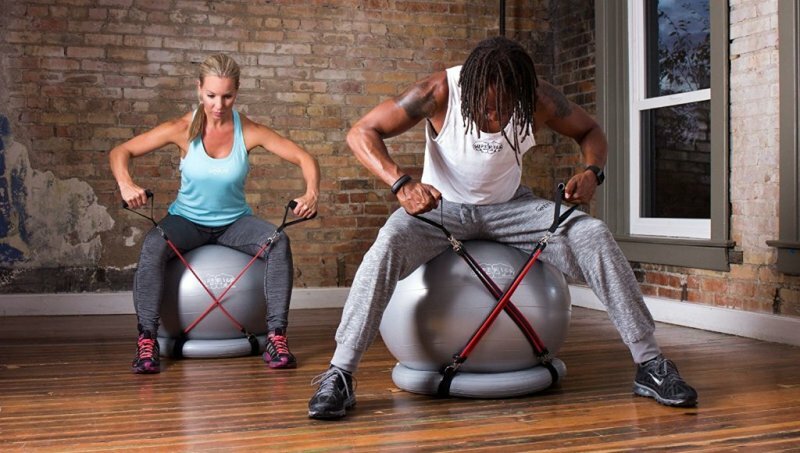 On the other hand, this exercise-ball is made of high-quality and durable PVC with anti-burst properties in-order hold up to 600-pounds while the included stability ring helps to hold the ball in place while you work out. 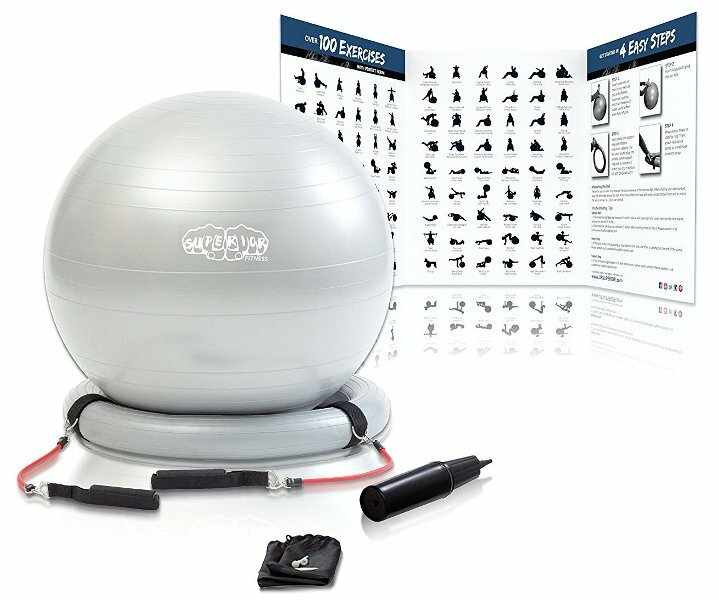 In conclusion, this exercise-ball will is ideal for core-exercises, balance-training, physical-therapy and over 100 isolation exercises. Made of a Heavy Anti Burst PVC Material. 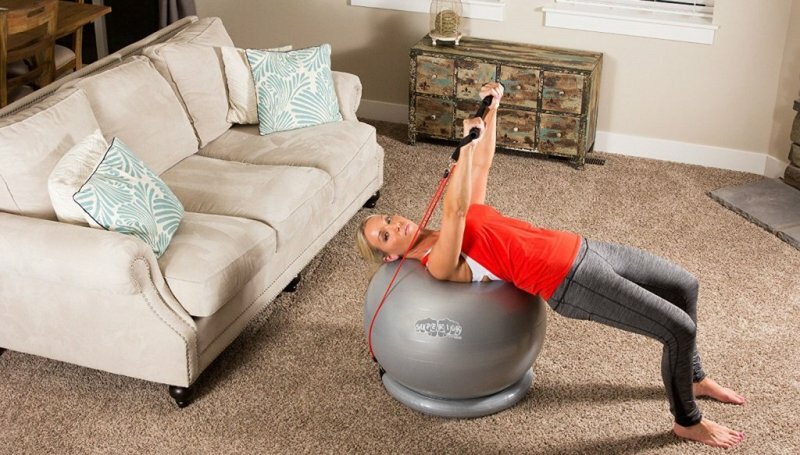 This exercise ball is designed to hold up to 600 pounds. Perfect For Home-use, Office-use and Physical Therapy. Custom Length Resistance-bands For Constant Tension On Your Muscles. A stability ring that ensures Safety While Doing 100 Isolation Exercises. Cushioned handles for optimum comfort when using resistance-bands. The kit includes an exercise-poster with over 100 isolation exercises. Includes a pump that makes inflating the ball easy. Improves Balance, Core Strength, Back Pain & Posture. 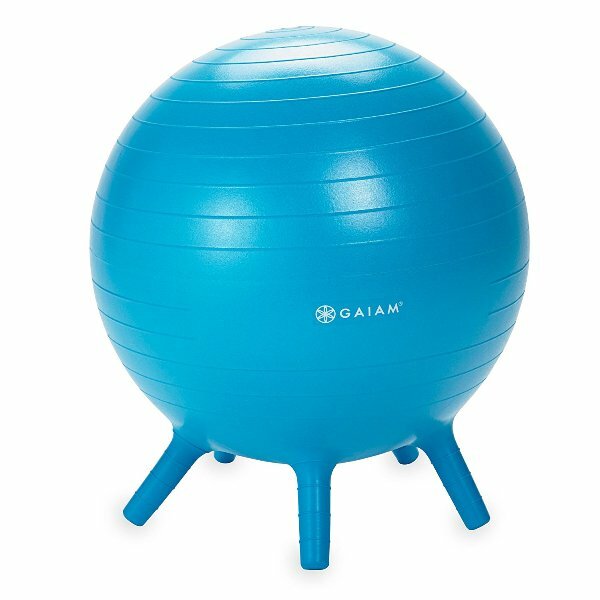 The Gaiam Kids Stay-N-Play Children’s Balance Ball is designed to provide flexible seat for high-energy and active kids coupled with 5 soft stabilizing legs that ensure it stays in place when not in use. In fact, this exercise-ball encourages kids to learn, adopt and practice a healthy posture while building core-strength from active sitting and play in the classroom and at home. Additionally, the exercise-ball movements help to increase on blood-flow to the brain in-order to boost concentration and focus while reducing on discomfort, boredom and distractions in the class by simply keeping the body and mind active. Lastly, this exercise-ball can act as an alternative seating option for kids in Elementary grade school classrooms providing an outlet for excess energy while reducing on fidgeting and it can even be used at home in-order to keep your kids active. It Features five built-in soft stabilizing legs. Encourages kids to learn and practice healthy posture. Increases on focus by keeping the body and mind active simultaneously. Helps to buildup core-strength from active sitting and play activities. Available in two sizes in-order cater for different kids. Available in several kid-friendly colors. Great alternative seating option for kids in classrooms or at home. Kids-ball size is recommended for children of ages 5-to-8 years. Kids-ball size is recommended for heights of 45”-to-50”. Junior-ball size is recommended for children of ages 8-to-12 years. Junior-ball size is recommended for heights of 51”-to-56. All the featured fitness-balls are perfect for stability, balance, core and yoga exercises for both women and men in 2019. In fact, this exercise-ball will help to improve on your sitting posture, increase on blood-flow, improve concentration/focus, eliminate back-pains and even prevent boredom or distractions whether you’re at the office, classroom or home.